The size of activated carbon is logically dependent on the shape or physical form of the matter and can be expressed in several measures. The size range of granular activated carbon (GAC) is usually expressed as the sieve sizes, expressed in mm or US Mesh, between which most of the GAC is retained. It is measured by shaking a sample of granular activated carbon through a defined series of sieves. In metric units it is the width between the sieves wires expressed in mm. In the US Mesh system the sieve size number refers to the openings between the sieves wires per inch. For example; a 8x30 US Mesh activated carbon means at least 93% of the granules by weight are larger than 30 Mesh (0.60mm) and at least 90% of the granules by weight are smaller than 8 Mesh (2.36mm). 12x40 US Mesh (0.42 to 1.70mm), 6x16 US Mesh (1.18 to 3.35 mm). The effective size of granular activated carbon is calculated as the size, expressed in mm, for which 10% by weight of granules are smaller. It is an indicator for the pressure drop and filtration performance of backwashed and segregate carbon beds. A lower effective size will have a higher pressure drop and will filter smaller particles which can result in a higher backwash frequency compared to carbons with a higher effective size. 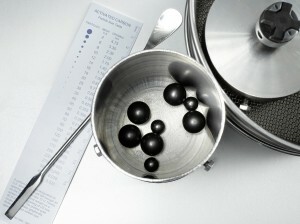 The undersize is the amount of activated carbon, expressed in % weight, which is smaller than the finest sieve. (eg % weight smaller than 0.60mm for a 0.60-2.36mm carbon). This quality parameter is often used to determine the potential losses during reactivation. The uniformity coefficient of granular activated carbon is calculated as the ratio of the size, expressed in mm, for 60% by weight of granules are smaller divided by the effective size. The smaller the uniformity coefficient, the more uniform the particles of the product are. A uniformity coefficient of 1 indicates all the granules have the same size. Granular activated carbons with a low uniformity coefficient are often used when installed in the first step filtration in drinking water production. The size of extruded activated carbons or pellets is normally defined by the diameter of the openings in the dies of the extruder. As a quality assurance, DESOTEC measures the amount of activated carbon, expressed in % weight, passing through a sieve smaller than the diameter of the pellet. For example, 4 mm pellets have a specification for the maximum passing through a sieve opening of 3.35 mm (US Mesh 6). The size range of powdered or pulverised activated carbon is generally determined by the amount of powder activated carbon, expressed in % weight, passing through 0.075mm sieve opening during a wet screen analyses. Typically minimal 90% by weight passes through 0.075mm.